AGMS Floating Armoury (FA) MV SEAPOL ONE maintains its position at 25° 10.0’N, 056° 55.0’E in the Gulf of Oman (OPL Fujairah area). 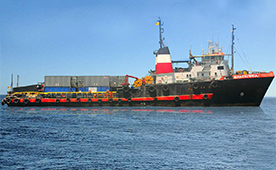 All transfers to and from ships are affected in and around this position. A variety of security related services are provided by this FA in support of the global anti-piracy operations. PMSCs owned weapons and related security equipment can be stored on-board. No time based storage fees will be charged for a duration of 90 days. PMSCs have to pay only for transfer of weapons to or from another vessel. 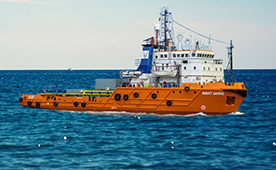 MV SEAPOL ONE can provide accommodation for over 50 sea marshals with meals at any given time. Shuttle boats between Sharjah port and MV SEAPOL ONE are available. 2 or 3 shuttle runs are carried out by couple of operators. Shuttle service packages are bundled with arrangement of UAE visa and other formalities. Transfers of personnel and/or equipment between MV SEAPOL ONE and other vessels are carried out using a service boat named PENGUIN MERLIMAU. Maximum safety measures are practiced during each transfer.